Our trucks and trailers meet U.S. DOT requirements. Tractor Trailer Dump Trucks, Triaxle Dump Trucks, Roll Off Services, & Pneumatic Dry Bulk Tankers. Don Martin Trucking has a long-standing reputation as a premier industrial service hauler. For decades Don Martin’s has long been associated with the companies that brought the Greater Pittsburgh area the moniker “The Steel City”. 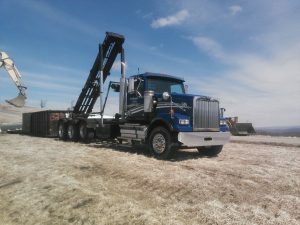 However, Don Martin Trucking has diversified to better serve a variety of businesses, with a modern fleet of over 50 trucks. Although, we are still heavily involved in the shipment of raw materials to steel producers, we have grown to include a variety of services. Our convenient location in Saxonburg, PA gives us an advantage by being able to service industrial facilities located in Western PA and Eastern OH. We are able to assist our customers through Just-In-Time material supply programs and custom tailored logistical solutions. If your company could use a strong transportation partner with decades of experience, give our team of experts a call.